When the Sutton Town Council decided to celebrate the coronation of King George V in 1911, a splendid programme of festivities was planned. On Coronation Day, Thursday 22nd June, a commemoration service in the parish church was followed by a procession. This procession was led by a brass band, then came the Mayor and all the top people in carriages, followed by fifteen “tableaux” laid on by various groups, such as “cottage industries” by the Maney Ward Allotment Association. After marching up Anchorage Road, and along the main road to Jockey Road, the procession returned to King Edwards Square where the Mayor entertained the top people to lunch. Festivities moved on to Sutton Park for athletic sports (Including a Ladies’ Bicycle Obstacle Race, third prize a silk umbrella) followed by a horse show and at six o’clock swimming sports at Blackroot Pool (the winner of the 75 yards handicap was awarded a “marble timepiece”.) 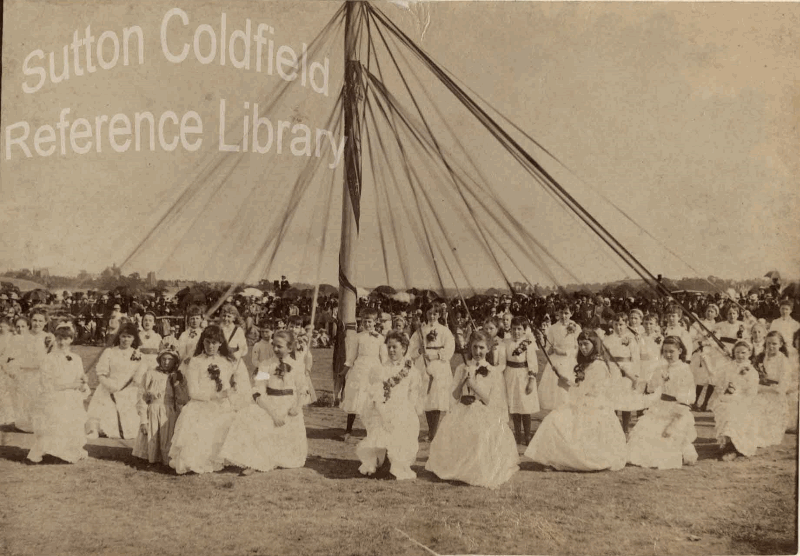 During the afternoon there was a brass band concert, and a programme of maypole dances and country dances near Holly Knoll by over 300 schoolchildren, who were afterwards taken to the tea tent. The day was rounded off with fireworks at Park House and a bonfire in the park. It had been a very windy day, and the procession, which formed at 10.30, did not start off until 12.15 - after an hour and a half trundling over cobbled streets in a high wind the tableaux were in disarray by the time they were judged - but otherwise all went according to plan, and on the following day the threatened rain held off. Friday’s festivities began at 12.30 with a dinner at the Crystal Palace for 600 old people - the over-sixties - afterwards the men were presented with tobacco and a pipe while the women received half a pound of tea. The afternoon was devoted to children’s sports in the park, a brass band adding to the noise. The 2,772 children attending each had a free ride at the Pleasure grounds and a free tea; the Mayor had been round the schools on the previous Wednesday distributing 3,200 coronation medals and coronation cups, including over 200 to the children at Princess Alice Orphanage. Only one event left a lasting mark on the Park, and this was the avenue of 28 lime trees planted along the road from Town Gate towards Blackroot. These twenty-eight trees were planted by the Mayor and Mayoress, Mr. and Mrs. Cartwright, and the ladies of 26 aldermen, councillors and officers. The ladies were all given a suitably inscribed silver spade, and some of the trees are still flourishing.